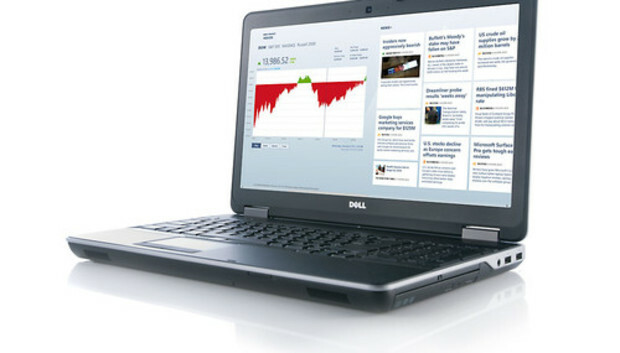 With Windows 7 as its operating system, Dell's Latitude E6540 feels like a throwback. Whether that's a good thing depends on what you're looking for in a business-class laptop. If you want a comfortable, expandable machine to take the place of a desktop, this might be just what the IT department ordered. But you'll have to contend with a dull, dated design and a high price tag. I'd also recommend a little weight training if you intend to travel with this beast. The E6540 is a big system, measuring a full 1.3 inches thick and rockin' the scale at 6.7 pounds. That leaves room to accommodate a 15.6-inch screen, a full-size numeric keypad, and a DVD+RW drive, but it doesn't make for a very travel-friendly laptop. Indeed, an extended battery protrudes a full inch from the rear. The Latitude E6540 has a decidedly old-fashioned keyboard. It's spacious and comfortable, offering more travel than most modern island-style keyboards. That's great for old-school typists like me, but may be a turnoff for younger users who are more accustomed to the newer designs. Although Dell provides both a keyboard-embedded pointing stick and a touchpad, the latter is small and doesn't support any gestures other than two-finger scrolling (which it handles very smoothly). Dell outfitted this machine with an Intel Core i7-4800MQ processor, 8GB of DDR3/1600 RAM, and a discrete AMD Radeon 8790M graphics card with 2GB of GDDR5 RAM. To preserve battery power, the system will automatically turn off the discrete GPU when it's not needed. So if you do end up traveling with the machine (remember, lift with your knees! ), you'll appreciate its above-average battery life (for a desktop replacement, at least) of 5 hours, 21 minutes. That firepower also helped the Latitude E6540 earn a Notebook Worldbench 8.1 score of 263, but that number would have been much higher had Dell installed an SSD (solid-state drive) instead of a paltry 500GB, 5400-rpm mechanical hard drive. These days, the only reason to have a hard drive is storage capacity, and 500GB isn't exactly generous. These shortcomings don't necessarily interfere with the E6540's appeal as a business-friendly laptop, especially for SMB and enterprise environments. In addition to a three-year warranty (including on-site service), Dell supplies a FIPS 140-2-certified Trusted Platform Module for secure credential storage, with Dell's ControlVault housing user passwords and credentials on a chip instead of the hard drive. You can also order the E6540 with a fingerprint reader for biometric security, but our review configuration didn't include one. Business users will find the Dell Latitude E6540 to be a comfortable desktop replacement, but anyone looking for power on the go will be happier with another system.